Following a team of international scientists, this film exclusively documents an archeological sensation: the exploration of royal tombs beneath the ancient Mexican city of Teotihuacán. Despite many decades of research, not much is known about the long-lost Teotihuacán society. But when archeologists enter the newly discovered burial chambers, they find the clues that may finally tell us who these mysterious people were. The film incorrectly states the city of Tikal is in Mexico when it is in Guatemala. Secrets of the Dead strives to get the facts correct and we regret the error. PRODUCED BY STORY HOUSE PRODUCTIONS INC. AND THIRTEEN PRODUCTIONS LLC FOR WNET IN ASSOCIATION WITH ZDF, ARTE AND ZDF ENTERPRISES GMBH. © 2016 ZDF ENTERPRISES GMBH AND THIRTEEN PRODUCTIONS LLC. ALL RIGHTS RESERVED. Teotihuacan: A mythical ghost town dating back 2,000 years. Little is known about the people who built this ancient city in the heart of what is today modern Mexico. In a hundred years of archaeological research in Teotihuacan, we still haven’t found a ruler’s grave. Scientists trying to unlock the secrets of Teotihuacan have discovered a hidden tunnel leading right to the center of the city. Who built this vast metropolis? And why did these powerful people seemingly vanish without a trace? The answers lie deep underground. Anything found beneath it must have been of upmost importance and sacredness. A spectacular journey into a mysterious world built beneath the first Mega City in the Americas, where scientists will find answers that explain the origins of an entire civilization. It was the biggest adventure of my life. The Aztecs reign over Mesoamerica as the last great culture before the Spanish conquest. As they venture south, a group of warriors makes a stunning discovery. Giant pyramids, the remains of an enormous ancient city – completely abandoned – a ghost town. The Aztecs are certain: Only the gods could have built this place. They call it "Teotihuacan," the City of the Gods. Nearly 700 years later, the Aztecs' question remains unanswered: Who built this magnificent city? One man believes he has found the answer: Mexican archaeologist Sergio Gomez Chavez. I have been working for 34 years in Teotihuacan and am about to uncover the mystery of the City of the Gods. The city is more than two thousand years old. 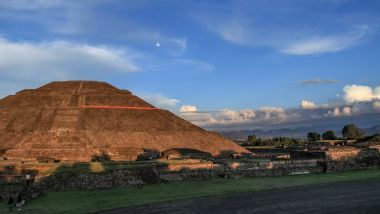 The Pyramid of the Moon lies at the northern end of the main avenue, the Street of the Dead. Towering nearby is the Pyramid of the Sun, the third-largest pyramid in the world. Their builders left no written records, only the ruins of their civilization. It's easy to imagine that the Aztecs themselves believed that this city was created by the gods. October 2003. Gomez was a junior archaeologist. His job: mapping the Pyramid of the Feathered Serpent, the smallest of the three pyramids in Teotihuacan. He was just walking toward the pyramid from his quarters to start the day’s work. Dr. Sergio Gómez Chávez	It had rained a lot those days, it was a very cold October 1st. Suddenly some colleagues walked down here to tell me that the rain had carved a crack in front of the Temple of the Feathered Serpent. Gómez remembers how he hurried down to the Pyramid of the Feathered Serpent. After some digging, he discovers a shaft that looks like a bottomless well. When I went down the tunnel I felt fear rise up in me. It was like losing control. I still don’t understand how I found my courage to go down there, with only a rope tied to my waist and no clue of what was coming. My heart was beating hard. I wanted to get out of there. But then there was the tunnel. I could see on one side that there was an opening. Every archaeologist dreams of a moment like this. Your work is driven by uncertain situations. Gómez crawls into the crevice. He can barely see two feet ahead. As I moved forward I touched the walls. They were very regular. And very quickly from the way they felt, I understood: these were not natural walls - they were constructed by human hands. They were part of an ancient structure. In situ: We can’t go further. and brings in a 3D laser scanner. Hundreds of thousands of lasers bounce off the tunnel walls back to this device, creating a map of what's ahead. The 3D image shows the tunnel continuing in a straight path, directly to the Pyramid of the Feathered Serpent which stands at the very center of the city. The pyramid represents the heart of Teotihuacan, its central landmark. A tunnel leading directly underneath the Pyramid of the Feathered Serpent must have some significance. So I came to the conclusion that the tunnel had been sealed to bury something or someone at the end of it – directly under the pyramid. I thought it could be a ruler or a king. David Carballo, professor of Archeology at Boston University, agrees with Gomez’s conclusion. He has been working at Teotihuacan for 17 years, concentrating on the city's living quarters. This is an example of an apartment compound. It’s where people would have lived. And it gives an idea of domestic architecture and residential space. Right here we are in the central courtyard, so rooms tend to be organized around the courtyard. On the walls, Carballo finds the remains of murals depicting gods and priests – and scenes of creation and paradise. They are the only record the people of Teotihaucan left, aside from the buildings themselves. Burying the dead in tombs beneath their residences was a common ritual in Teotihuacan. The skeletons themselves reveal even more about the origins of the people who inhabited this mysterious city. At the lab, Carballo and his colleague, biological anthropologist Rebecca Storey, examine several bones. This is an example of a burial found underneath an apartment compound in the Tlajinga district. It’s a male skeleton. From the artifacts found with the remains, the scientists theorize that he may have been a leader of a neighborhood on the outskirts of the city. But there's still more to learn from these bones. He died in Teotihuacan. But one of the interesting questions we have is where did he live? Was he a Teotihuacano all his life? And as it turns out as one of the most exciting things that's come up in skeletal analysis has been the ability to test where people lived as children and as teenagers. And the secret is the teeth. The teeth form from a time that you are a very small child up until you are an adolescent. And as it turns out once the enamel has formed it is permanent, nothing changes. The drinking water that you take up as a child and then gets incorporated into your enamel has different isotopic signatures depending on where you were geographically and climate wise. And what you do is, you test the enamel of the teeth and you test the bone and you see if they are the same. His teeth were tested and turned out to have a signature very different from Teotihuacan. Isotope tests conducted on dozens of other remains all yield the same results. With this information, Carballo and Storey conclude that tens of thousands of Teotihuacan's ordinary citizens came from other parts of Mesoamerica. What that tells you is that they are migrants. Carballo now understands people came to Teotihuacan because of catastrophe elsewhere. The eruption of Popocatepetl volcano in the mid late first century was what volcanologist would describe as A V.E.I. 6 eruption. And for some perspective a historical eruption of that magnitude went off in Indonesia and could be heard in Australia. A catastrophe of epic proportions. After the volcanic eruption, they sky was darkened for extended periods. The soothing and the blackening of the sky because of the volcanic ash would have affected sunlight and agriculture. This would have seemed like an apocalyptic scenario to people living around the volcano. The magnitude of this eruption, and its human toll, were devastating. People could have believed the gods had turned against them. Settlements were destroyed, livestock died out. The very air and soil became toxic from volcanic fallout. The people were forced to move north as fast as they could. They found refuge in a valley and settled there. When they came to Teotihuacan they were leaving a place that was probably burnt and seemed like a hell and they were coming to this paradise. It was also nicely removed from seeing the volcano Popocatepetl, which couldn't be seen from the vantage of Teotihuacan. For the refugees, this safe location- 60 miles from the volcano- must have offered a fresh start. The mild climate and fertile ground made it perfect for agriculture. Here, they will ultimately build a city unparalleled in the Americas. 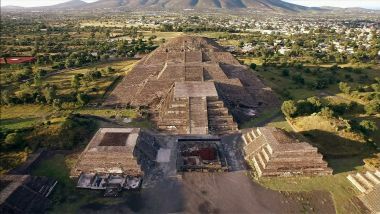 The refugees arriving from the areas of eruptions would have felt that they are getting a second chance at Teotihuacan. That here they had the opportunity to build a new order and leave behind the one that was destroyed. Back in the tunnel, Sergio’s team has dug their way more than 100 feet closer to the Pyramid of the Feathered Serpent. They have removed more than 400 tons of soil and debris. ...Backbreaking work. The work we do here every day in the tunnel comes with many dangers. The tunnel also poses a risk to our health. We noticed that there is a gas flowing inside the tunnel. This gas, radon, can, according to studies, cause lung damage. But as difficult and dangerous as these conditions may be, they also represent an upside for the scientists. The humidity can have the effect of preserving things; these conditions are actually really beneficial for us. As they excavate the tunnel, they find hundreds of artifacts: mallets, chisels, hammers--wooden tools preserved under these special conditions. They are incredibly special and unique, because more than one of these objects has never been found in the history of Teotihuacán before. This is very important for us, because these objects will allow us to backdate and learn from what time and what context they originate. Analysis shows the tools were made around 150 AD, at exactly the time when the main structures above ground were also built. Wooden tools like this where used with stone hammers to dig the tunnel. The traces are still there. We found holes like this all over the tunnel. The rock in the Teotihuacan Valley is volcanic. It is extremely difficult to excavate. For the first time, Gómez appreciates how hard it really must have been for the builders of this mysterious tunnel. You have to remember that back then they didn’t have metal tools. For this reason, wood or processed bone was used in the construction of the tunnel. A handprint left by one of the ancient workers, preserved for almost two millennia. For a moment, Sergio can touch the past. As an archaeologist this is incredible, because it’s as if I’m touching the hand of the person who worked in this exact spot 2000 years ago. And it’s more than just the tunnel... these people built this entire city with their bare hands. You have to imagine, that these are people without pack animals, without the wheel and this construction is occurring on the backs of humans, who were dumping fill of rocks and rubble to erect some of the largest monuments of the ancient world. Even more impressive, they did it in a very short amount of time. …More than a thousand years before the wheel was introduced in the Americas. Pigment traces on the buildings reveal something else astonishing. Teotihuacan was a painted city, it was full with spectacular murals covered in white stucco and pigments that came from different parts of Mexico. The city must have been magnificent. Colors adorned the major buildings. A far cry from its beginnings as a squalid refugee camp. In the second century AD, Teotihuacan was the largest and most important metropolis of Mesoamerica. To David Carballo and Sergio Gomez, it is clear the ancient inhabitants built the city in honor of their gods... and one in particular: The Feathered Serpent, Quetzalcoatl! There are earlier appearances of the God within central Mexico and other parts of Mesoamerica, but it's Teotihuacan, where it first really comes together as a clear cult. Quetzalcoatl, as the Aztecs will call him hundreds of years later, is the god of creation, the harbinger of life itself. With his feathered collar and rattlesnake tail, he is half bird, half snake. The ancient Teotihuacanos installed an estimated 260 of these stone heads on the pyramid in honor of the Feathered Serpent. Clearly the Feathered Serpent was the most important god in Teotihuacan. But for the inhabitants, the god of creation was also a god that could take life. Over the years, scientists have found a number of hidden chambers inside the Pyramid of the Moon. . The remains of sacrificial animals were discovered inside the chambers. The builders must have buried the animals alive and constructed the pyramid around them. There are predators, there are raptor birds or occasionally there be animals associated with the souls of dead warriors. In many cases it’s clear that these animals went in alive. So for instance, some of them have evidence of having been in cages. The remains of the wooden beams of the cage, they were preserved. But the builders did not stop at animal sacrifices. Humans were also part of the sacrificial offerings in major pyramids. A lot of the sacrificial remains have their arms tied behind their backs, and this suggests they didn't go in willingly. Whether they went in alive is another issue, they might have been clubbed or drugged before they went in. In other cases there might have been examples from the moon pyramid of having been buried alive. The sacrificial offerings at the temples were acts of consecration. So they were making space sacred and making a new construction phase of a pyramid or temple sacred. And that required the giving of life. Although not all remains show signs of trauma, the ancient human sacrifices prove that this was a culture willing to commit murder for the greater spiritual good. Rebecca Storey examines one of the skulls found in the Moon Pyramid. It belonged to a young man. She explains how the ritual was performed. He was decapitated, how do I know that? He's got one of the cervical vertebrae that is right under the head. Those are usually found with decapitated individuals. The head was detached from the body just below the first vertebra. The bones tell her even more about this brutal ritual. This individual was probably killed another way before the head was taken. These injuries on three parts of the skull are preserved. These cuts actually aren’t the cause of death. They would cut somebody back here, and then here the mandible has cut marks on it, too. So it means they were cutting here. But she doesn't believe beheading was the cause of death. They probably sacrificed him through the heart. Because it/he had lots of blood and certainly this was a very common way to sacrifice people. There are pictures in Teotihuacan of hearts on an altar, so it makes sense, that maybe his heart was taken. That meant he would have been dead by the time they were trying to take his skull. About 40 victims have been found in the different layers of the Moon Pyramid. Even more bodies have been found at the Pyramid of the Feather Serpent, where Gomez's tunnel seems to be leading: 200 ceremonial victims in symmetrically-arranged, mass burial sites. From a modern perspective human sacrifice can seem especially cruel, but we have to imagine a religious system in which there was a strong idea of covenants, where the Gods had given and sacrifice and they needed to be fed and time itself needed to continue going through sacrifice. Back in the tunnel, where the mass graves were found, Gomez's team is slowly making progress. They have found what appears to be a deeper pit more than 80 yards from the tunnel entrance. ..and immediately call Gomez over to have a look. The pit contains precious jade artifacts. We found a number of chains and extremely valuable objects. We know they must have been of immense value to the Teotihuacanos, because they were brought here from far away. This type of jade only exists in Guatemala… 600 miles from Teotihuacan. Whoever owned these objects must have been of high-status, because they were able to import them. Assuming only people of high status would own valuable objects like these, they must have belonged to an important person. And the next discovery makes clear how important they must have been. A blade made of obsidian. For Teotihuacan, obsidian played a very important role. The rare stone blade was sometimes used as a tool, but most certainly in the ritual killings. This knife that we found is an exceptional find. It’s incredibly well-made and shows no signs that it was ever even used. It was put here deliberately as part of a very important sacrifice. The archaeologists now believe this sacrificial blade was buried here with the only type of person who would wield it: A priest. David Carballo sets out to visit the source of the precious green obsidian. He is heading to El Chico National Park about 30 miles north of the ancient ghost town. Here, he meets Alejandro Pastrana, one of the world’s leading experts on obsidian. Pastrana found the ancient obsidian mine of Teotihuacan. This is where the sacrificial blades came from. It's the only place in the world where green obsidian of this quality can be found. Here we have obsidian fragments. They only emerge when lava solidifies rapidly with a more than 10 percent share of water. Let’s chip off a shard to test the quality. You can see how green this one is, it’s extremely sharp when it first detached. It’s the sharpest material in nature. This edge, if you look under high magnification, it’s completely smooth unlike surgical steel you can see that it’s rough compared to obsidian. Sharp like a scalpel, obsidian was known as the metal of the Americas. Scientists have found this valuable green obsidian all over Mesoamerica: as far north as Arizona and all the way to Guatemala and Belize in the south. Teotihuacan controlled the most desired material of the Americas. It made the city an economic powerhouse. Meanwhile, the team continues to excavate. Beyond the pit, 100 yards further into the tunnel, they make yet another revealing discovery. A stash of gigantic seashells. These shells were most likely used as horns during the ritual killings... perhaps calling the people of Teotihuacan to watch the holy executions. There's hundreds of large shells that were placed in the tunnel, also as an offering. We can tell that most of them come from the Caribbean. They were imported to Teotihuacán and then also just stored inside the tunnel. Some shells are painted with images of holy animals like crocodiles. They were valuable and only priests would have been able to afford them. As the archaeologists wonder about the shells, they continue to find more artifacts. The quality and sheer mass of their findings is an archaeological sensation. We found over 40,000 objects made with green stone and about 4,000 of these objects are Jade. All of this Jade comes from the area around the river Motagua in Guatemala. We see Teotihuacan expanding throughout central Mexico and into more distant places. In the third century the focus of building at Teotihuacan really changes. It goes from these large pyramids and monuments to apartment compounds, which would have housed the population of this large city. It appears, at the height of its power, the leaders of Teotihuacan initiated a huge housing program. Even the apartments for ordinary citizens had remarkable amenities. They were built of volcanic rock, featured an interior kitchen, and had separate bedrooms. The apartments even had a functioning drainage system. At that time it’s one of the largest cities In the ancient world. Teotihuacan had a population of over a hundred thousand people. For comparison London didn't reach that population until the sixteenth century. And the scientists have noticed something striking. There is no fortifications around it, it sits on a valley's floor, it is completely exposed and there is also no evidence for any sort of external threat ever having attacked the city. Further there is no written records and within the art of the city we don't see any clear evidence of an external warfare. Six hundred miles away, in what is today southern Mexico, lies the city of Tikal, once ruled over by the formidable Maya. This stone stele is where the Mayans kept an account of their history. Nikolai Grube, from the University of Bonn in Germany, is one of only a few people in the world who can decode the Mayan writings. And he has found something that may also shed light on the mystery of Teotihuacan. On the basis of the very detailed Maya calendar, we can pinpoint what happened in what time of history. The most fascinating part of this long inscription is located here, in the middle of the stele. It begins with a date. A date that corresponds to the 15th of January 378. And according to the hieroglyphic text, this was when foreigners came from the west. And most interestingly at the same day the king of Tikal entered the water. To enter the water is an expression for death. So he died. This is certainly not an accident. The illustration seems to depict an invasion. A foreign army from the west invading Tikal. They killed the Mayan king – and installed a ruler of their own. On this side of the monument we see the newly inaugurated king, Yax Nuun Ahiin, who exceeded to power in 379 AD. He is dressed in a totally different way, not in a Maya style. In his hand he carries a spear-thrower. And it’s this particular weapon that helps identify the invaders... and their king. The atlatl or spear thrower would be used to project darts or thrown spears at a much higher velocity than you could with your arm. So it represents a superior projectile technology for the time. At this point of time the only civilization in Mesoamerica which used a spear thrower was Teotihuacan. Therefore we think that Yax Nuun Ahiin came from Teotihuacán, that he is a Teotihuacano king, who was placed in power by the arriving foreigners. And he became the founder of a new Teotihuacan related dynasty in the Maya low lands. Yax Nuun Ahiin means 'Green Crocodile' in the Mayan language. That the Maya wrote his name down suggests he was a powerful ruler. The foreigners left a deep impact on classic Maya culture. They changed Maya architecture. They brought a new form of dress, new ceramics forms of mural painting. In general the art all of the sudden changed, but it is not only the art. The Maya also adopted one of their conquerer's gods: The Feathered Serpent – the Teotihuacan god of creation. The Maya called it Kukulkan. These stairs at the famous Mayan Temples at Chichen Itza, built more than 600 years after the invasion, are identical to the symbols of The Feathered Serpent at Teotihuacan. Maya kings tried to draw prestige by associating themselves with Teotihuacan and it symbols. And this would be similar to the Kaisers of Germany looking to Rome as an earlier model. I would speak of a shift in Mesoamerican history. The conquest of Tikal probably is part of an expansion polity which extended the limits of Teotihuacan power as far north as the modern border between Mexico and the United States and to the South to Honduras. What if the “Green Crocodile”, the Teotihuacan leader who subjugated the Maya, was an expansive ruler like Alexander the Great or Napoleon? Could Sergio Gomez and his team have discovered his grave at the end of the tunnel? Now, the tunnel grows very narrow. Gomez sends in a robot to explore what lies ahead. Dr. Sergio Gómez Chávez	We've discovered that the tunnel descends at least three meters from the level from which we started. We don’t know what it is because we suddenly had a wall in front of us, which led down. At first, we thought that the geo radar would show us a room at the end of the tunnel. But when the robot got in there, we found out that there was actually not just one room, but three large areas. So we know now that three main chambers are located at the end of the tunnel. Three chambers – each more than 100 square feet wide – form a cross as if to mark something directly underneath the pyramid. The location of these three chambers lines up exactly with the vertical axis of the Temple of the Feathered Serpent. We don’t understand how they managed to calculate the exact point where the axis lines up with the pyramid located several meters above. The chambers at the end of the tunnel lie under the geographical center of Teotihuacan… and Gomez has a theory about why. This is where the underworld and the heavens meet. The workers start excavating the first chamber and, after removing only a foot of debris, make yet another stunning discovery. A statue – in perfect condition. Because we recognize the clothing, we see that the statue clearly represents a woman. This sculpture symbolizes a very important element, and it’s very likely that it was connected with fertility. And then they find another statue. Exactly here next to the female sculpture we have also found a smaller male sculpture. And on every side of the two there’s another woman, and they all seem to point back to middle. This center is the same point that connects exactly with the imaginary path between the underworld and heaven. So I believe that these sculptures have been placed here to act as watchmen and guard this particular place. Gómez thinks that the four guardians must have been protecting something important in the tunnel. He is intrigued that their placement seems to align their gazes in such a way that their visual axis intersects right in the very center of the room. Continuing their excavation, the archaeologists find more artifacts. Gomez is certain – they must have been some kind of offering. But the team reaches the bottom before finding anything else. We imagined that we’d find a person’s remains. We thought it would be the burial place of some ruler. We were surprised, when we found – nothing! Gomez and his team must face the disappointment. And yet, he cannot believe this intricately designed space under the center of the city holds no meaning. He and David Carballo return to the chamber one more time to see if they might have missed something. When they inspect the walls, they notice what looks like a waterline. I think that the Teotihuacanos excavated this last stretch of the tunnel deeper to make sure that it was permanently filled with water. But why would the ancient builders dig below the ground water level...on purpose... and cause the lower chamber to fill with water just as a well might? The ground water would have seeped into this lower chamber, creating an artificial, underground lake. Why would they have put a lake directly under the Pyramid of the Feathered Serpent, the god of creation? Gómez remembers the mural found in the apartments and an idea begins to form. 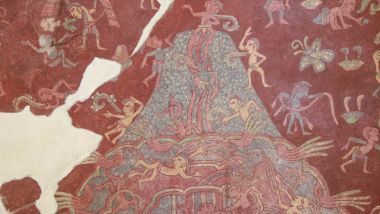 The mural shows an image of a mountain. Emerging from its inside is the water from the underworld. The underworld is a place full of riches, a place of abundance and fertility. This painting reminds Gomez of what he has seen in the tunnel. Could he be looking at a representation of how the Teotihuacanos believed the world was created? The Pyramid of the Feathered Serpent could represent the Holy Mountain. And the tunnel could stand for the underworld from which the water flows up. The idea may not be so farfetched. In many other ancient cultures, pyramids were built to represent mountains. If Gómez is right, the Pyramid of the Feathered Serpent represents the holy mountain. And the underground lake symbolizes the origin of life, springing eternally from underneath the pyramid. Gomez has found traces of a metallic substance applied to the tunnel walls. It’s pyrite, the mineral also known as fool’s gold. It is impressive. This looks like virtually the entire tunnel, the walls and ceiling were covered with this metallic mineral powder. Imagine in the light of torches the tunnel covered with all this metallic mineral powder. It really must have been incredible. It must have looked like a starlit night! It is Indeed a Portayal of their Cosmos. Now we can begin to understand the meaning and significance. For Gómez - the pieces of the puzzle finally come together. The artifacts were offerings not only to the gods of creation, but to the very source of life itself. All in this magnificent model located 60 feet underground. Gomez imagines this is where the priests of Teotihuacan made their offerings. This chamber represents their idea of how life began. This holy lake, with its illuminated sky, was used as a stage for their dramatic rituals. The Teotihuacanos created the underworld in these tunnels and the chamber under the pyramid. But here, instead of seeing the underworld as a place of death, it's actually seen as a place of creation. The Teotihuacanos erected their pyramids in honor of the gods and they built an underground replica of their cosmos to worship them. But then, the gods turned against the people once again. And once again, a volcano seems to control the fate of Teotihuacan. In 536 AD, the Illopango, a super volcano, erupts in El Salvador. Another volcanic winter. Even though it was hundreds of miles away, the smoke and ash would have hidden the sun for days. With the harvests ruined, the city could no longer feed its people. What we see archaeologically next to the major temples and buildings of the street of the dead, is around the mid to late 6th century there was a massive scale burning in there. There’s traces that can be registered both on the architecture itself and on the materials such as the actual roof beams that fell down to the floor of the structure. To Carballo, it doesn’t look like an attack from the outside. There is no damage in the outer districts. There was this internal and very targeting burning of the city's center; over a hundred buildings around the Street of the Dead were burnt. The end result could have been something like revolt. Carballo thinks the people might have rejected the gods who failed them yet again. And they set the sacred heart of their city ablaze. Soon after, the city was deserted. The state had collapsed; the city was no longer an impressive place. And then it moved into the realm of myth. The economic and political powerhouse no longer existed. But its legacy has lived on for centuries. Even after the collapse of Teotihuacán, the Maya continued to venerate Teotihuacan gods and their religion. So did the Aztecs until the time of the Spanish conquest, hundreds of years after the Mayans were gone. Teotihuacan was a high point in the history of Mesoamerica. And its mysteries have remained unsolved... until now. Gomez and his colleagues seem to have uncovered the very source of the city’s existence. That's what makes this discovery so special, by understanding their vision of the cosmos and their religion; we now have a much better understanding of these ancient Mesoamerican people. 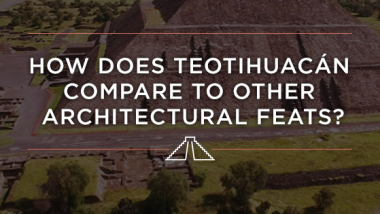 How does Teotihuacán Compare to Other Architectural Feats?